How Well Do You Know Spanish for Christmas? Christmas in Puerto Vallarta, Mexico. Bud Ellison/Creative Commons. 1. In Spanish-language Bibles, who were the parents of the baby Jesús? Mary and Joseph's names are rendered in Spanish as María and José, both of which are common names today (as is Jesús). Many Spanish-speaking countries, including Spain and Costa Rica, have a city, San José, named after Joseph. Images of Mary are especially common in Mexico, where has become a national symbol. 2. In a tradition known as _____, Mexicans re-create the quest for a place to stay in Bethlehem. Posada is the equivalent of the English "inn," although it can also refer to lodging in general. Las Posadas, which also takes place in parts of Central America, traditionally lasts nine days to represent the nine months of pregnancy. In English, it is very common to use nouns as adjectives (they're known as attributive nouns), but normally you can't do that in Spanish. Some nouns have adjectival forms, and you usually can form adjectival phrases using de. Thus Christmas cards can be called either tarjetas navideñas or tarjetas de Navidad. Note that navideño is not normally capitalized. 4. The popular carol "Silent Night" is known as what in Spanish? Notice how Spanish song titles such as Noche de paz aren't capitalized except for the first word and proper nouns. 5. What is Christmas Eve known as in Spanish? Both víṡpera de Navidad (literally "the eve of Christmas") and Nochebuena (literally "good night") are in common use. Víspera is a cognate of "vespers." 6. From which Spanish-speaking country did the poinsettia originate? Spanish names for the poinsettia include la flor de Nochebuena, la flor de Pascua, la flor de fuego, la estrella de Navidad y la corona de los Andes. 7. What is the traditional Spanish name for the men who came from the East to worship the baby Jesus? The Wise Men or the Magi are traditionally known as los Reyes Magos (Magi Kings) or los Tres Reyes (Three Kings). In U.S. Spanish, a calque of Tres Hombres Sabios (from "Three Wise Men" in English) is sometimes used. Their traditional names in Spanish are Gaspar, Baltasar y Melchor. 8. On which day in Spanish-speaking areas do many people play jokes on each other? Dec. 28 is el Día de los Santos Inocentes (Day of the Holy Innocents), which commemorates the day, according to Christian tradition, that Herod ordered the killing of innocent baby boys in Bethlehem in a vain attempt to kill Jesus. Because Jesus, Mary and Joseph had fled to Egypt, the joke was on Herod. Today, people play jokes on each other and then say "¡Inocente, inocente!" to the victim, much as U.S. residents observe April 1 by shouting "April fool!" 9. What is the name of the religious service that is often observed late on Christmas Eve? The midnight or late-night Mass on Christmas Eve is popularly known as la Misa de Gallo (or la Misa del Gallo), the Rooster's Mass. In some areas it's known as la Misa de Aguinaldo. Aguinaldo has various meanings including a Christmas gift, a Christmas bonus, a type of music played at Christmas, and a type of plant that blooms around Christmas. 10. 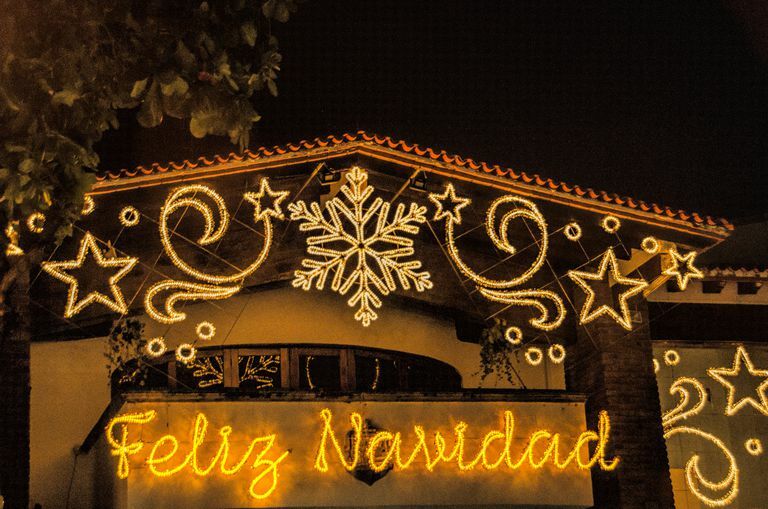 Which of these might you find find yourself eating in a traditional Christmas meal in Spain? Traditional Christmas meals vary with region, but common possibilities include pavo trufado (turkey stuffed with truffles), roast lamb, seafood soup and cochinillo asado (roast pig). 11. What is a Spanish name for Santa Claus? Traditions about the white-bearded man vary with region, but all of the above names are common. With regard to Viejito Pascuero, Viejito is an affectionate nickname for an old man, while Pascuero comes from Pascua, a word that can refer to religious holidays that include Christmas, Easter and Passover. 12. In much of the Spanish-speaking world, it is common to give gifts on which day after Christmas? 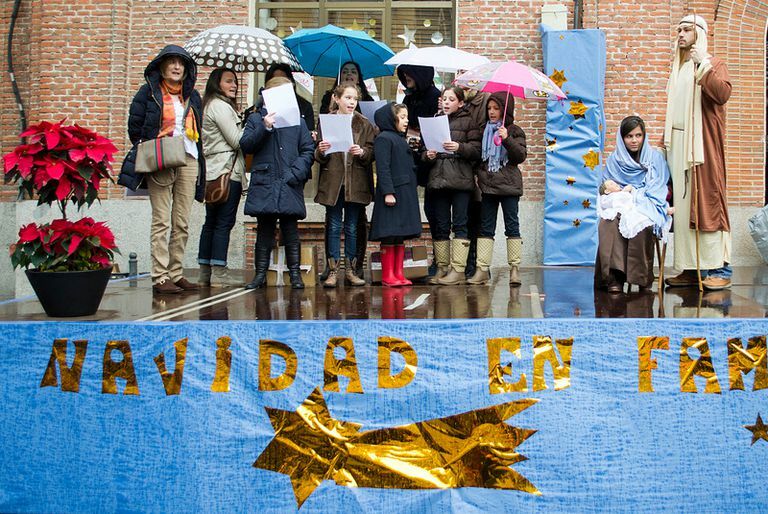 Jan. 6, popularly known as el Día de los Reyes Magos, observes the day the Magi brought gifts to the baby Jesus. You got: % Correct. Perfect! La Navidad en la Ciudad de México. 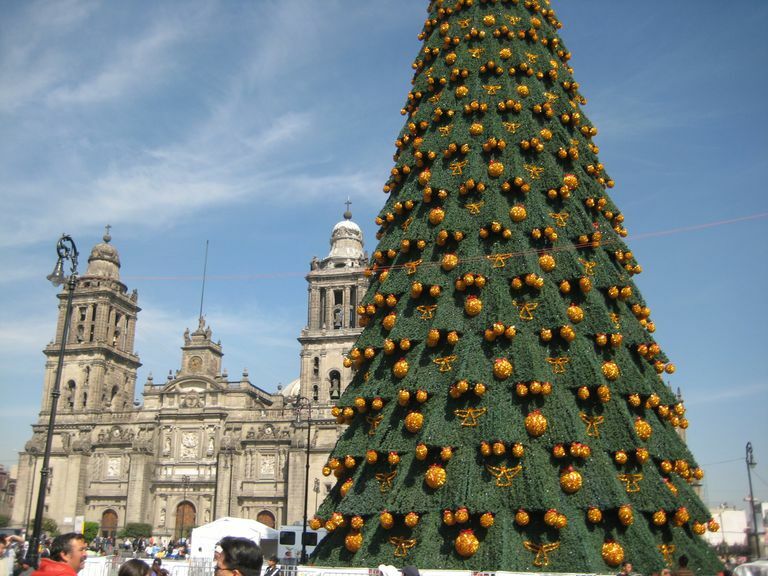 (Christmas in Mexico City.). Abraham P V/Creative Commons. Congratulations! What a great way to close out the year! You have shown that you know not only the Spanish language, but also the cultures of the areas in which it is spoken. 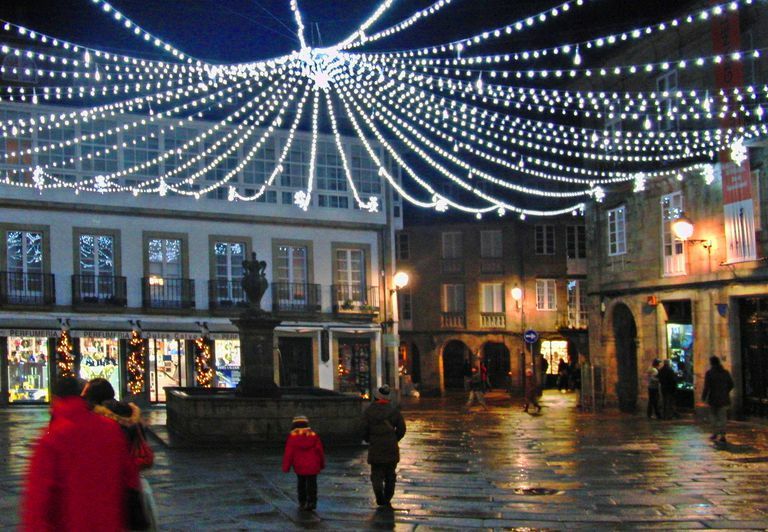 Christmas in Santiago, Galicia, Spain.. Amio Cajander/Creative Commons. You didn't get a perfect score, but you still showed you know quite a bit about Christmas in the Spanish-speaking world. Keep up the good work! You got: % Correct. Keep on Studying! Singing Christmas songs in Valladolid, Spain.. Iglesia in Valladolid/Creative Commons. You're still learning Spanish, and if you keep at it you'll soon master the vocabulary and grammar involved in talking about Christmas and other holidays throughout the year.